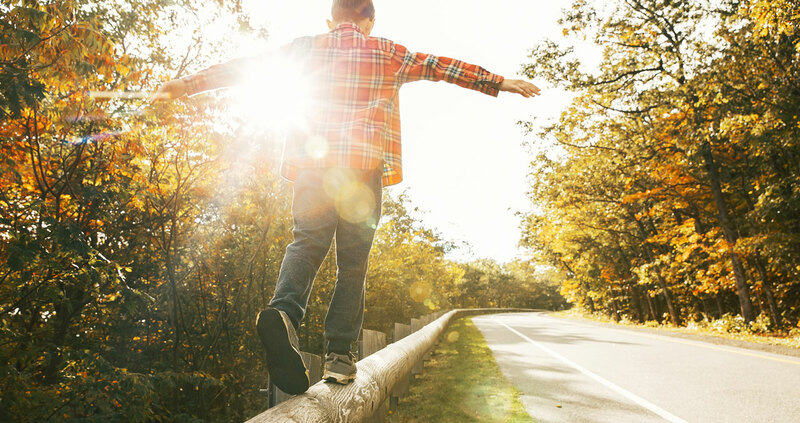 LITTLE AXE—From school stresses to peer pressure on social media, today’s teens face enormous challenges. One eighth grade student in Little Axe, though, has faced a major challenge that very few are forced to deal with. Rachel and family attend an OU football game. Since the diagnosis was made, Rachel—the daughter of Cindy and Pastor Bryce Scott of Little Axe, Cornerstone Indian—has undergone countless medical treatments, including dozens of spinal taps, chemotherapy treatments, hospital stays and doctors’ visits, amounting to more than two years of bad days and good days. Through it all, Rachel, who made a profession of faith in Christ at Indian Falls Creek, has held tightly to the hope she has in Jesus Christ. That verse is inscribed on purple-pink-colored wrist bands, along with the phrase “Rachel’s Courage,” which she and her parents and brothers hand out to people they encounter. 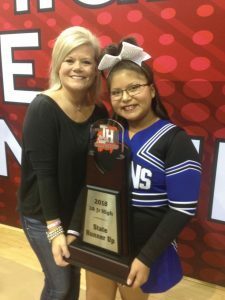 Prior to discovering her disease, Rachel was involved in numerous activities, including cheerleading, Native American dancing competitions, soccer and more. 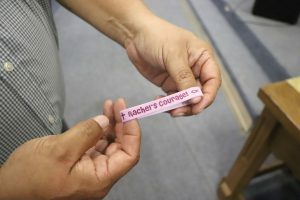 People wear ‘Rachel’s Courage’ wrist bands as a prayer reminder. “The chemo has been hard on her. We’ve been at the hospital a lot,” Cindy said. In spite of many challenges that came, encouragement for the Scott family has come in many forms, including the Cornerstone Indian Church fellowship rallying to help. Rachel’s Little Axe Cheerleading Coach, Shandelle Self, has selflessly encouraged Rachel throughout the journey. Rachel and Shandelle were recently featured on a KFOR-TV News Channel 4 broadcast. Rachel with her cheerleading coach and mentor Shandelle Self. When asked what God has taught her through her trials, Rachel has learned to trust the Lord and to try to bless others who are struggling. 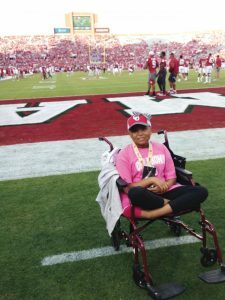 “As we spent time at (OU) Children’s Hospital, we could typically tell when a new child (patient) was there, and Rachel would always go out of her way to be kind to the other kids,” Cindy said. The family has been able to share their testimony at various events, including at some conferences that were not faith-based. When asked what she wants to be when she grows up, “I want to be a Pediatrician and help kids,” she said with a smile. As she continues to journey through this trial, Rachel is already helping other kids—and countless other people—as she grows up. God’s plans to give Rachel “a hope and a future” are evident to her family and to any who meet this bright young lady. Rachel’s courage, in the end, comes from Christ’s strength.